The fashion world has long used the concept of a “lookbook” to promote a line, or a season — and now the term is starting to pop up in other merchandise arenas. So what is a lookbook? Originally a collection of printed photographs compiled to showcase a designer or retailer’s offerings, a lookbook today can also refer to an online portfolio, sometimes as part of a blog. And how does a lookbook differ from a catalogue? For starters, it does not usually show items individually, or list pricing and ordering information. The emphasis is on presenting fashionable ensembles, worn by models, in a way that helps the viewer make style decisions. And a lookbook was traditionally used for the presentation of a fashion line to a wholesale buyer, as opposed to a retail catalogue aimed at consumers. 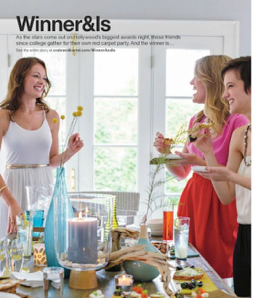 Recent Crate & Barrel catalogues combine the lookbook approach with traditional catalogue advertising. They show attractive models (including our daughter-in-law Nina O’Keefe, on the left in the photo above) using the products offered on the adjacent pages. Instead of just selling merchandise, the catalogues tell stories, sometimes including additional information such as recipes. They show the merchandise in use and help customers imagine how it would look in their own homes. Because a lookbook is mostly photos, with very little text, there is a great similarity between the lookbook concept and Pinterest. If you have a Cosy Christmas board on your shop’s Pinterest page, for example, you can show a variety of decor items in use, offering a selection your own photos (taken in the store or in a home) with lifestyle shots provided by your vendors. I think that this type of photograph is much more appropriate to Pinterest than a picture of a single product against a white background. The key word in describing a successful lookbook is “inspiration”. You want to show shoppers how wonderful your products are, and how they can be used to improve their own lives. And you want them to go from just taking a look to having a strong incentive to come into your store to shop.